Kozhukattais, obbattus and sojji appam top the list of sweets prepared during almost all the South Indian festivals . Savoury pidi kozhukattais using lentils are usually prepared for Sri Varamahalakshmi pooja. Here is an easy recipe for preparing sweet pidi kozhukattais for a change. Cardamom powder - 1 pinch. 1. Heat one teaspoon of ghee in a heavy bottomed pan. 2. Add cashew nuts and fry till they become golden in colour. 3. Remove the cashew nuts and set aside. 4. 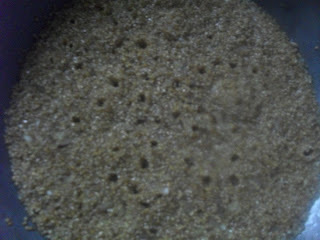 In the same pan roast the broken wheat till they pop and become white in colour giving out a pleasant aroma. 5. Dissolve jaggery in 3 cups of warm water and filter. 6. Bring the jaggery water to a boil adding fresh grated coconut. 7. Add the roasted broken wheat , cover with a lid and cook on medium flame stirring now and then. 8. When the broken wheat is half cooked and comes together in a lump, add the remaining ghee and cardamom powder, mix well and switch off flame. 9. Keep it covered and let it cool down for fifteen minutes. 10. Knead the sweet mixture and add the roasted cashew nuts. 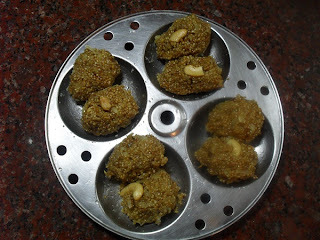 11.Take lemon sized balls and shape them into kozhukattais. 12. Steam the pidi kozhukattais in a pressure cooker for fifteen minutes with out the weight. 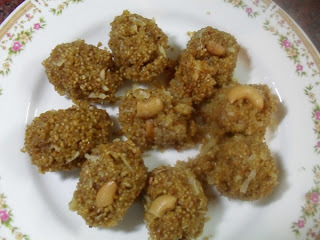 Offer the delicious Vella Pidi Kozhukattais to Sri Varamahalakshmi. Share all the prasadams with the near and dear ones on this happy occasion of VARAMAHALAKSHMI POOJA. Loved your wheat version of the kozhukkattai...Sounds interesting. Super, thank you for your recipe. I was looking for something that didn't involve rice. I absolutely love it.